The death toll from a devastating earthquake in central Italy climbed to at least 250 on Thursday and could rise further with rescue teams working for a second day to try to find survivors under the rubble of flattened towns. The 6.2 magnitude quake struck a cluster of mountain communities 140 km (85 miles) east of Rome early on Wednesday as people slept, destroying hundreds of homes. Dozens of emergency workers with sniffer dogs clambered over piles of debris trying to find anyone still buried beneath, while cranes removed huge slabs of fallen masonry and trucks full of rubble left the area every few minutes. "People like myself have lost everything, but at the same time the fact that we have survived means we have to move forward one minute at a time," said Alessandra Cioni, 45, who managed to crawl out of her crumpled house after the quake. "We have been saved, not like half the people in this place who have lost their lives," she said, breaking down in tears. A violent aftershock on Thursday afternoon sent rescuers fleeing as stones fell from the already severely damaged bell tower of the 15th century church of St. Augustine in Amatrice. The jolt, which struck fear and panic in survivors, detached the church's facade, leaving it leaning dangerously over the main street where the emergency services were working under blue skies and hot summer sun. The original earthquake was powerful enough to be felt in Bologna to the north and Naples to the south, both more than 220 km (135 miles) from the epicenter. Almost 200 of the victims died in Amatrice, which is famed for a local pasta dish and was full of holidaymakers ahead of its 50th annual food festival, set for this weekend. Up to 15 tourists were believed to have been buried when the town's Hotel Roma imploded. It was unclear how many seasonal visitors were in the area on Wednesday, making it hard to track the number of deaths. "We need to know firstly the exact number of people who are missing before we can say what work is waiting for us," fire department spokesperson, Luca Cari, said. "We will obviously move forward without interruption until we are sure there is no one left." One Spaniard, five Romanians, and a number of other foreigners, some of them care-givers for the elderly, were believed to be among the dead, officials said. Aerial video taken by drones showed swathes of Amatrice, last year voted one of Italy's most beautiful historic towns, completely flattened. The nearby towns of Pescara del Tronto, Arquata del Tronto and Accumoli fared little better, leaving thousands of people homeless. The Civil Protection Department has sent up tents for some of the survivors and there was no official comment on how long reconstruction work might take. Italy has a poor record of rebuilding after quakes. Some 8,300 people who were forced to leave their houses after a deadly earthquake in L'Aquila in 2009 are still living in temporary accommodation, waiting for their homes to be restored. About 365 people injured in Wednesday's quake were hospitalized, the Civil Protection said, noting that about 5,000 people, including police, firefighters, soldiers and volunteers, were involved in post-quake operations. Rescuers working through the night and illuminated by banks of lights saved a 10-year-old girl, pulling her alive from the rubble where she had lain for about 15 hours. Many other children were not so lucky. A family of four, including two boys aged eight months and nine years, were buried when a church bell tower toppled into their house in nearby Accumoli. Magistrates opened an investigation into whether there had been any negligence in the recent restoration of the tower. Another investigation was opened into why Amatrice's school had collapsed, despite the fact it had only opened in 2012 and was meant to have been earthquake-proof. Most of the buildings in the area were built hundreds of years ago, helping to explain the widespread destruction. Cultural Minister Dario Franceschini said all 293 culturally important sites, many of them churches, had either collapsed or have been seriously damaged. Prime Minister Matteo Renzi's cabinet was due to meet on Thursday to decide emergency measures to help the affected communities. "Today is a day for tears, tomorrow we can talk of reconstruction," he told reporters late on Wednesday. The head of the Civil Protection Department said he feared the death toll might surpass that in L'Aquila, which killed more than 300 people. While hopes of finding more people alive diminished by the hour, firefighters' spokesman Luca Cari recalled that survivors were found in L'Aquila up to 72 hours after that quake. Most of the damage was in the Lazio and Marche regions, with Lazio bearing the brunt of the devastation and the biggest toll. Neighboring Umbria was also affected. All three regions are dotted with centuries-old buildings susceptible to earthquakes. The country's most deadly earthquake since the start of the 20th century came in 1908, when an earthquake followed by a tsunami killed an estimated 80,000 people in the southern regions of Reggio Calabria and Sicily. The death toll from a powerful earthquake that shook central Italy rose to 247 on Thursday, officials said, as rescuers desperately searched for survivors in the rubble of devastated mountain villages. Hundreds of others were injured, some critically, and an unknown number were trapped under the ruins of collapsed buildings after Wednesday's pre-dawn quake. Amid scenes of carnage, dozens of emergency services staff and volunteers were determined to attempt to pluck more survivors from the ruins. Rescuers had pledged to work through the night in the hope of finding people alive in the mangled wreckage of homes. Prime Minister Matteo Renzi had earlier warned that the toll would likely rise after visiting the badly hit village of Amatrice. Hundreds of people spent a chilly night in hastily assembled tents with the risk of aftershocks making it too risky for them to return home. Scores of buildings were reduced to dusty piles of masonry in communities close to the epicentre of the quake, which had a magnitude of between 6.0 and 6.2. It hit a remote area straddling Umbria, Marche and Lazio at a time of year when second-home owners and other visitors swell the numbers staying there. Many of the victims were from Rome. The devastated area is just north of L'Aquila, the city where some 300 people died in another quake in 2009. Most of the deaths occurred in and around the villages of Amatrice, Accumoli and Arquata del Tronto. Guido Bordo, 69, lost his sister and her husband after they were trapped inside their holiday house in the hamlet of Illica, near Accumoli. "There's no sound from them, we only heard their cats," he told AFP before the deaths were confirmed. "I wasn't here. As soon as the quake happened, I rushed here. They managed to pull my sister's children out, they're in hospital now," he added, wringing his hands in anguish. Among the victims was a nine-month-old baby girl whose parents survived, an 18-month-old toddler and two other young children who died with their parents in Accumoli. Two boys aged four and seven were saved by their quick-thinking grandmother, who ushered them under a bed as soon as the shaking began, according to reports. She also survived but lost her husband. Renzi said it was too early to consider what might have been done to prevent the disaster. "Today is the time for tears and emotion," he said, vowing that his government would start reconstruction work first thing on Thursday. 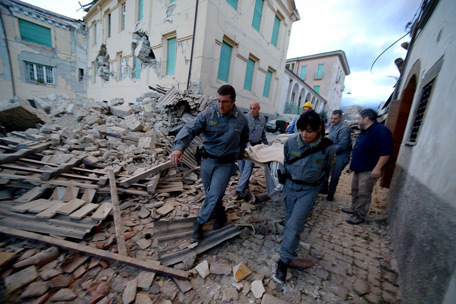 It was Italy's most powerful earthquake since the 2009 disaster in L'Aquila. "Half the village has disappeared," said Amatrice mayor Sergio Pirozzi, surveying a town centre that looked as if had been subjected to a bombing raid. The tremors were strong enough to be felt 150 kilometres (90 miles) away in Rome, where authorities ordered structural tests on the Colosseum. Some of the worst damage was in Pescara del Tronto, a hamlet near Arquata in the Marche region where the bodies of the dead were laid out in a children's park. With residents advised not to go back into their homes, temporary campsites were being set up in Amatrice and Accumoli as authorities looked to find emergency accommodation for more than 2,000 people. Amatrice is a hilltop beauty spot considered home of amatriciana, one of Italy's favourite pasta sauces. It is popular with Romans seeking cool mountain air at the height of the summer. It was packed with visitors when the quake struck at 3:36am (0136 GMT). Three minutes later the clock on the village's 13th-century tower stopped. The first quake measured 6.2, according to the United States Geological Survey (USGS). It measured 6.0 according to Italian monitors, who put the depth at only four kilometres. A 5.4-magnitude aftershock followed an hour later. Italy is vulnerable to earthquakes and the 2009 tremor in L'Aquila led to lengthy recriminations over lax building controls and the failure of authorities to warn residents that a quake could be imminent. David Rothery, Professor of Planetary Geosciences at Britain's Open University, said the shallowness of Wednesday's quake had made it more destructive. But he added: "Unlike the L'Aquila quake, which was preceded by swarms of smaller quakes and led to claims - unjustified in my view - that the eventual big quake should have been predicted, this one appears to have struck out of the blue." A powerful earthquake devastated a string of mountain towns in central Italy on Wednesday, trapping residents under rubble, killing at least 73 people and leaving thousands homeless. The quake struck in the early hours of the morning when most residents were asleep, razing homes and buckling roads in a cluster of communities some 140 km (85 miles) east of Rome. It was powerful enough to be felt in Bologna to the north and Naples to the south, each more than 220 km from the epicenter. A family of four, including two boys aged 8 months and 9 years, were buried when their house in Accumoli imploded. As rescue workers carried away the body of the infant, carefully covered by a small blanket, the children's grandmother blamed God: "He took them all at once," she wailed. The army was mobilized to help with special heavy equipment and the treasury released 235 million euros ($265 million) of emergency funds. At the Vatican, Pope Francis canceled part of his general audience to pray for the victims. Rescue workers used helicopters to pluck trapped survivors to safety in the more isolated villages, which had been cut off by landslides and rubble. Aerial photographs showed whole areas of Amatrice, voted last year as one of Italy's most beautiful historic towns, flattened by the 6.2 magnitude quake. Many of those killed or missing were visitors. "It's all young people here, it's holiday season, the town festival was to have been held the day after tomorrow so lots of people came for that," said Amatrice resident Giancarlo, sitting in the road wearing just his underwear. "It's terrible, I'm 65-years-old and I have never experienced anything like this, small tremors, yes, but nothing this big. This is a catastrophe," he said. The national Civil Protection Department gave the official death toll of 73 at about 12 hours after the pre-dawn quake struck. Scores more will still believed unaccounted for, with the presence of the summer holidaymakers making it difficult to tally. Patients at the badly damaged hospital in Amatrice were moved into the streets. "Three quarters of the town is not there anymore," Amatrice mayor Sergio Pirozzi told state broadcaster RAI. "The aim now is to save as many lives as possible. There are voices under the rubble, we have to save the people there." Stefano Petrucci, mayor of nearby Accumoli, said some 2,500 people were left homeless in the local community, made up of 17 hamlets. Residents responding to wails muffled by tonnes of bricks and mortar sifted through the rubble with their bare hands before emergency services arrived with earth-moving equipment and sniffer dogs. Wide cracks had appeared like open wounds on the buildings that were still standing. The national Civil Protection Department said some survivors would be put up elsewhere in central Italy, while others would be housed in tents that were being dispatched to the area. Prime Minister Matteo Renzi said he would visit the disaster area later in the day: "No one will be left alone, no family, no community, no neighborhood. We must get down to work .. to restore hope to this area which has been so badly hit," he said in a brief televised address. A spokeswoman for the civil protection department, Immacolata Postiglione, said the dead were in Amatrice, Accumoli and other villages including Pescara del Tronto and Arquata del Tronto. Most of the damage was in the Lazio and Marche regions. Neighboring Umbria was also affected. The U.S. Geological Survey, which measured the quake at 6.2 magnitude, said it struck near the Umbrian city of Norcia, while Italy's earthquake institute INGV registered it at 6.0 and put the epicenter further south, closer to Accumoli and Amatrice. INGV reported 150 aftershocks in the 12 hours following the initial quake, the strongest measuring 5.5. The damage was made more severe because the epicenter was at a relatively shallow 4 km below the surface of the earth. Residents of Rome were woken by the tremors, which rattled furniture, swayed lights and set off car alarms in most of central Italy. "It was so strong. It seemed the bed was walking across the room by itself with us on it," Lina Mercantini of Ceselli, Umbria, about 75 km away from the hardest hit area, told Reuters. The last major earthquake to hit the country struck the central city of L'Aquila in 2009, killing more than 300 people. The most deadly since the start of the 20th century came in 1908, when an earthquake followed by a tsunami killed an estimated 80,000 people in the southern regions of Reggio Calabria and Sicily. An earthquake devastated a string of mountainous towns over a swathe of central Italy early on Wednesday, trapping residents under hills of rubble, with at least 20 people believed killed and many missing. The quake struck in the early hours of the morning when most people were asleep, razing homes and buckling roads in a cluster of towns and villages some 140 km (85 miles) east of Rome. The emergency services released an aerial photograph showing whole areas of the town of Amatrice flattened, while debris filled the streets of nearby Accumoli. "Now that daylight has come, we see that the situation is even more dreadful than we feared, with buildings collapsed, people trapped under the rubble and no sound of life," said Accumoli mayor Stefano Petrucci. Wide cracks appeared like open wounds on the buildings that were still standing. Residents sifted through the rubble with their bare hands before emergency services arrived with earth-moving equipment and sniffer dogs. The quake hit during the summer when the populations of the communities in the area, normally low during the rest of the year, are swelled by vacationers. Officials said six people were known to have died in Accumoli and a further six were reported dead in Amatrice. Sky Italia television said 10 had died in the nearby village of Pescara del Tronto. Some 100 people were still unaccounted for in the village of Arquata del Tronto. A Reuters reporter said the town's hospital had been badly damaged by the quake, with patients moved into the streets. RAI reported that two Afghan girls, believed to be asylum-seekers, were also missing in the town. The earthquake caused damage to towns in three regions - Umbria, Lazio and Marche. The U.S. Geological Survey, which measured the quake at 6.2 magnitude, said it struck near the Umbrian city of Norcia, while Italy's earthquake institute INGV registered it at 6.0 and put the epicentre further south, closer to Accumoli and Amatrice. The damage was made more severe because the epicentre was at a relatively shallow 4 km below the surface of the earth. Residents of Rome were woken by the tremors, which rattled furniture, swayed lights and set off car alarms in most of central Italy. Olga Urbani, in the nearby town of Scheggino, said: "Dear God it was awful. The walls creaked and all the books fell off the shelves." INGV reported 60 aftershocks in the four hours following the initial quake, the strongest measuring 5.5. Central Italy was hit by a powerful, 6.2-magnitude earthquake on Wednesday, triggering the collapse of dozens of buildings and a red alert for the possibility of casualties and further damage. Witnesses in the area told Italian media that many buildings had collapsed in villages close to the epicentre of the quake near the town of Norcia in the region of Umbria. "Half the village has disappeared," said Sergio Pirozzi, mayor of Amatrice, a mountain village in neighbouring Lazio that was packed with visitors at the peak of the summer season. He said access to the village had been blocked, making it impossible for rescue services to get through. "There is a landslide on one road, a bridge is about to collapse on the other one," he said, quoted by the AGI news agency. Amatrice is famous in Italy as a beauty spot and is a popular holiday destination for Romans seeking cool mountain air at the height of the summer. There were no immediate reports of casualties after the first quake, which struck shortly after 3.30 am, according to the United States Geological Survey, or a 5.4 magnitude aftershock an hour later. USGS's PAGER system, which predicts the impact of earthquakes, issued a red alert - suggesting significant casualties and damage based on previous quake data. A resident of the Rieti region, which is between Rome and the epicentre of the quake, told the Rainews24 channel that she and most of her neighbours had come out onto the street after feeling "very strong shaking". In 2009 a 6.3-magnitude earthquake in the Aquila region, which was also felt in the Italian capital, left more than 300 dead. Italy is often shaken by earthquakes. Another quake hit the northern Emilia Romagna region in May 2012, when two violent shocks 10 days apart left 23 people dead and 14,000 others homeless.